The scorpionfish is a venomous fish that blends well amongst the coral reefs. The fish is covered in prickly spines that carry highly toxic venom. Scorpionfish do not attack humans, but can inflict painful stings with the release of potent venom, when they are handled. What are the Causes of Scorpionfish Sting? What are the Signs and Symptoms of Scorpionfish Sting? How is First Aid administered for Scorpionfish Sting? If a Scorpionfish Sting (or sting or bite of a marine creature) is suspected, it is always important to call your local emergency helpline number (or 911 in the US) without any delay, and provide as much information as possible, even if the individual does not have any symptoms. Who should administer First Aid for Scorpionfish Sting? What is the Prognosis of Scorpionfish Sting? The prognosis of Scorpionfish Sting is dependent on the potency of the toxin, the severity of reaction, and timely manner in which treatment is administered. How can Scorpionfish Sting be Prevented? Andrich, F., Richardson, M., Naumann, G. B., Cordeiro, M. N., Santos, A. V., Santos, D. M., ... & Figueiredo, S. G. (2015). 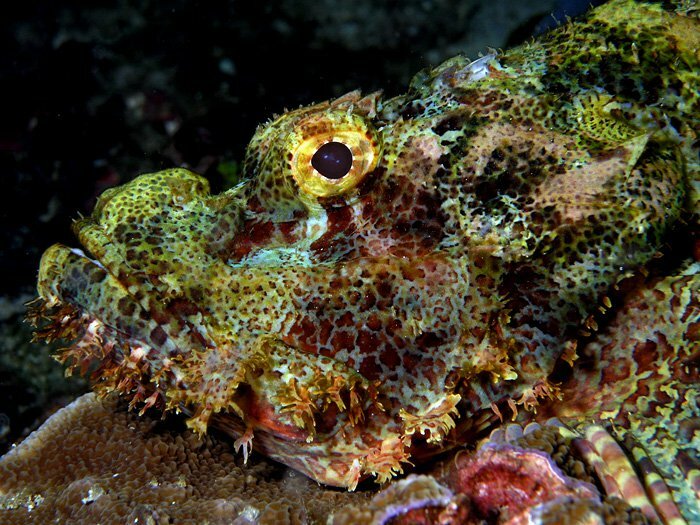 Identification of C-type isolectins in the venom of the scorpionfish Scorpaena plumieri. Toxicon, 95, 67-71. Matić-Piantanida, D., Vidaković-Bival, V., & Radman, V. (2016, July). AND SCORPION FISH VENOMS. In Natural Toxins: Proceedings of the 6th International Symposium on Animal, Plant and Microbial Toxins, Uppsala, August 1979 (p. 99). Elsevier. Billies, R. (2016). New Species of Scorpionfish in the Caribbean. Pachaiyappan, A., Sadhasivam, G., Arumugam, S., & Muthuvel, A. (2015). Bio Prospecting the Enzymatic and Anticancer Potential of Spine Secretions of Marine Catfish (Plotosus lineatus). Journal of Biologically Active Products from Nature, 5(6), 406-418. Barrett, C. J., Johnson, M. L., & Hull, S. L. (2016). Population dynamics of two sympatric intertidal fish species (the shanny, Lipophrys pholis and long-spined scorpion fish, Taurulus bubalis) of Great Britain. Journal of the Marine Biological Association of the United Kingdom, 1-7. Krishna, M., Rao, N. V., & Rao, G. V. (2015). NEW RECORD OF LOW FIN SCORPION FISH SCORPAENODES PARVIPINNIS GARRETT (1836) FAMILY SCORPAENIDAE FROM INDIAN WATERS. Advances in Pharmacology and Toxicology, 16(3), 69. Dattin, A., Hudelo, C., De Haro, L., Kurzenne, A., & Labadie, M. (2016, January). Treatment of pain using only hot water baths after weever and scorpion fish envenomations on the French coast. In CLINICAL TOXICOLOGY (Vol. 54, No. 4, pp. 510-511). 4 PARK SQUARE, MILTON PARK, ABINGDON OX14 4RN, OXON, ENGLAND: TAYLOR & FRANCIS LTD.